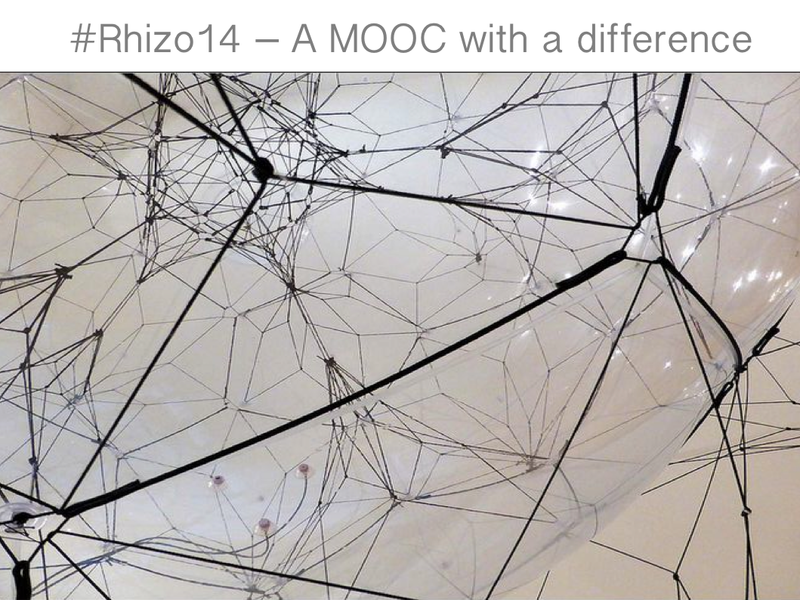 Jenny, thanks so much for publishing this discussion about how you are researching cMOOCs such as Rhizo14. I think you are onto some new ideas here. I especially like how you position yourselves as researchers in the very system that you are researching—an absolutely critical decision, I think, for rhizomatic research. Rhizomatic research is always conducted from the middle, defining inside-out, not outside-in. As it happens, I have just started a series of posts about how to conduct rhizomatic research which you may find useful. I know that I am likely to use some of the ideas I have gleaned here in my own thinking. Thanks, again, and I’m eager to learn more, as I always do when I read you and Frances. Mark – thank you so much for your comment and for providing more details about your wonderful drawing. I would be really interested to know what the original size of this drawing is. I have corrected the credit under the image in this post and will ensure that it is always credited correctly. I looked all through your website when looking for images for our presentation. You have many works which fit with the idea of rhizomatic teaching and learning. If we hadn’t decided on sticking to black and white, ‘England’s Dirty Rotten Gardens’ – http://markingham.org/works/the-consumption-of-elements/tcoe-inside-1/ – would also have been a very good fit. Thanks so much for sharing your work online and for commenting here. PS – that is a fascinating connection between Alan Turing and your grandfather. Is it your grandfather’s work online anywhere? Hi Keith – thanks for your comment. 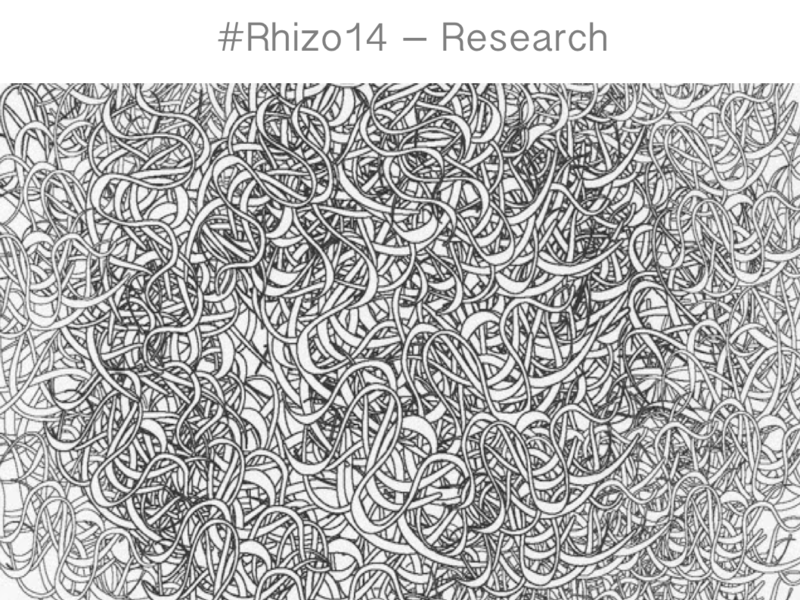 Yes – I noticed you too are posting about rhizomatic research. I haven’t commented yet, because I wanted to read Dillenbourg’s chapter first – which I haven’t yet got round to 🙂 But I will be following your posts with interest. I’ve been reflecting since yesterday about how much ‘secret Deleuze & Guattari’ actually made it into the course. I meant too… I’m now going to go back and see how much I really did. It was not left out on purpose, but the week two debates on theory i think had a negative impact on their inclusion. I’ll be very interested to see if it makes it in next time. I agree with Keith, I’m learning lots from the way your folks are balancing your inclusion as participants and your perspective as researchers. @Keith The involved, reflexive researcher is a feature of many forms of qualitative research. I am very curious to see how that will work in your auto-ethnography work – hoping to learn from it. ‘The group thinks of itself as a community’ Who is this group and why are they calling me a member? I would suggest there is a contradiction in terms between ‘rhizomatic learning’ and ‘the community is the curriculum’. ‘A community’ could be ‘curriculum’ and could talk about ‘rhizomatic learning’ but a community or a curriculum is NOT rhizomatic learning. I have the impression that there is a confusion at the start of this – the rhizome as a network is NOT ‘a community’. ‘New kids on the block’ – is an ‘old MOOC lurker around the ‘blocks’ a new kid? Whose is the ‘block’? Who decides on who is a ‘new kid’? ‘No centre for the course’ – clearly people are ‘looking for a centre’ even if they themselves and the activities across ‘the course’ or the ‘convenor/instigator’ are only APPARENTLY at the centre. One example of this is the network visualisations of Twitter from Hawskey – I can find myself ‘at the centre’ of a network image but this in itself is only an image created via a particular criteria and is relative to a particular illusory view of ‘centre’. As you Jenny yourself pointed out – in a rhizome there is no centre – which is the source of our confusion. An experience doesn’t have to be positive or negative to appear at a moment or other (when the environment changes) to be influential. Surely this is a key aspect of rhizomatic learning – concentrating on shoots during a six week period in one place in one garden is absurd. I agree that there is a problem with ‘traditional research’. 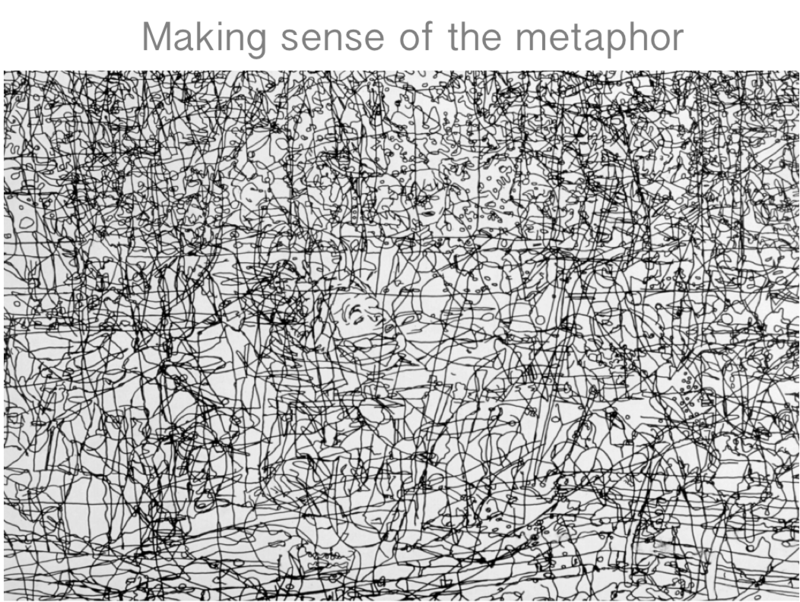 Ah yes coming back to the rhizome metaphor for teaching and learning (or research) for me the most important contribution of it is to concentrate on complexity, mulitplicity and uncontrollable upshoots. When we are looking for short-term ‘manageable’ research projects and ‘manageable data sets’ and ‘manageable outcomes’ we are going to look to artificially control ‘education’. Ah yes. Is a link to a blog post in a FB group and to a #rhizo14 considered as a FB post, a tweet or a blog post?? Actually to correct myself or should I say to give another vision on what came out of my typing- concentrating on shoots in one space in a short period is not absurd as long as one sees them as only one whole of the part of the whole which in iself is artificially separated from the whole by our own incapacity to look beyond seeing as believing. In other words the only thing which counts is to evidence multiplicity in nothing and everything. Absence in CONNECTION is presence. The only thing worth concerning ourselves with is the essence of our connections. Pingback: Rhizomatic and Nomadic Learning | Tools for strategic and strong-minded thinkers!